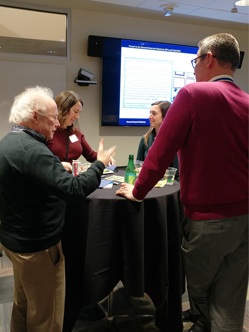 Michigan Medicine continues to support #ProudtobeGIM as the Division of General Medicine and the Society of General Internal Medicine (SGIM) sponsored its second successful event on Monday, February 12, 2018, hosted by Mariana De Michele, MD, Assistant Professor in General Medicine, and Robert Ernst, MD, Senior Associate Chief for Ambulatory Care and Assistant Professor in General Medicine. 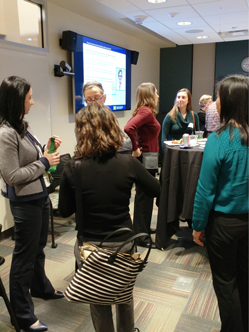 Faculty, residents and staff gathered together at the new West Ann Arbor Health Center - Parkland Plaza clinic for a night of casual mingling and networking. The objective of this event was to highlight “A Day in the Life” of an outpatient General Internist. It successfully provided insight to outpatient medicine careers and fostered open dialogue with current leaders in primary care. Why did you choose a career in General Internal Medicine (GIM)? What are some highlights of your profession? What message would you give trainees interested in a career in outpatient General Internal Medicine? Why did you choose GIM? I chose outpatient General Internal Medicine because of the intellectual challenge required to take care of a patient in all aspects of their health. I am intrigued by the variety of cases on a day-to-day basis in the office. I particularly enjoy forming long-lasting relationships with patients. I am the quarterback of their medical care, something that patients are very thankful for. I take care of the entire patient. Outpatient General Internal Medicine is a rewarding career that will not only provide you with a great sense of accomplishment and long-lasting relationships with patients, but that will also allow you to have a good work-life balance in the future. General Internal Medicine requires expertise across a very broad range of areas and provides a daily challenge to address the many and diverse needs of patients. I specifically chose to specialize in not specializing. The highlights of my professional life include both the deeply personal relationships I enjoy with patients and also the highly rewarding collegial relationships I have been able to form with partners in clinic, inter-professional teams, and with specialists. My message to trainees is that the practice of Primary Care General Medicine is like a decathlon in sports. Others may be more expert in any one event, but you become highly capable in most everything. GIM gives me the privilege to deliver ongoing comprehensive primary care to adult patients. This exciting field allows me to provide preventive care as well as manage complex conditions. As a general internist, I have the opportunity to make the initial assessment, provide evidence-based recommendations, and guide patients through this very complex health system. Developing long-lasting relationships with my patients which are centered in trust. Empowering patients with knowledge about their chronic conditions and witnessing successful outcomes of self-management. When I am able to partner with patients in modifying their lifestyles to manage their chronic conditions and make substantive progress without pharmaceuticals. General Internal medicine is a gratifying and rewarding career. General internists play a critical role in healthcare and are needed to lead the transformation of the current healthcare delivery model. While not the most celebrated; I believe that general internists have the greatest impact on patient outcomes and their overall experience. 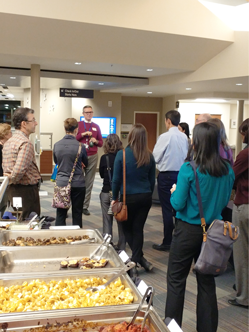 The event concluded with a tour of the newest addition to the Michigan Medicine ambulatory clinics, leaving each attendee with a fresh perspective on “A Day in the Life” of a General Medicine Internist.